The International Consortium for Investigative Journalists (ICIJ) and The Huffington Post estimate that 3.4 million people have been physically or economically displaced by World Bank-backed projects since 2004. These people have been forced to leave their homes, their land was taken or their livelihoods were severely damaged. According to this investigation, in which more than 50 journalists were involved, the World Bank has regularly failed to live up to its own policies for protecting people harmed by projects it finances. In Ethopia for instance, authorities diverted millions of dollars from a World Bank-supported project to fund a violent campaign of mass evictions, according to former officials who carried out the forced resettlement program. The extensive, multimedia investigative reportage examining The World Bank’s practice in various countries and regions can be found here. 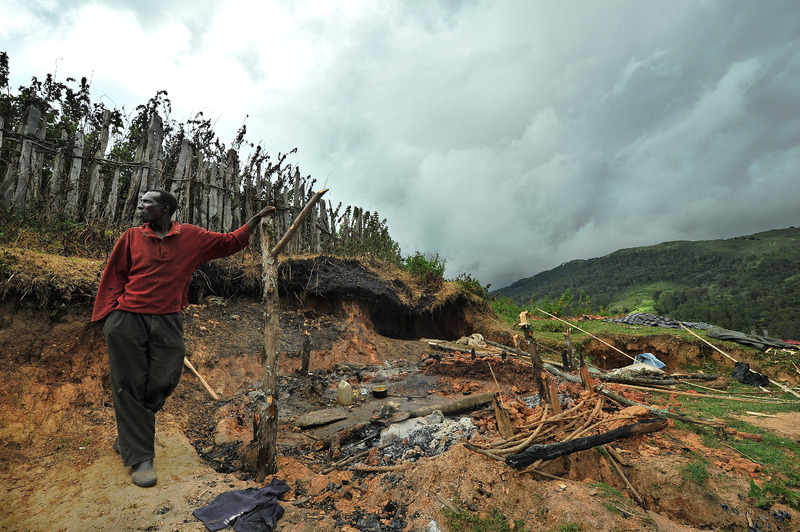 Photo: Joseph Kilimo Chebet, a father of five, standing next to the burned remains of his homestead in Kenya, destroyed only hours prior by Kenya Forest Service officers.